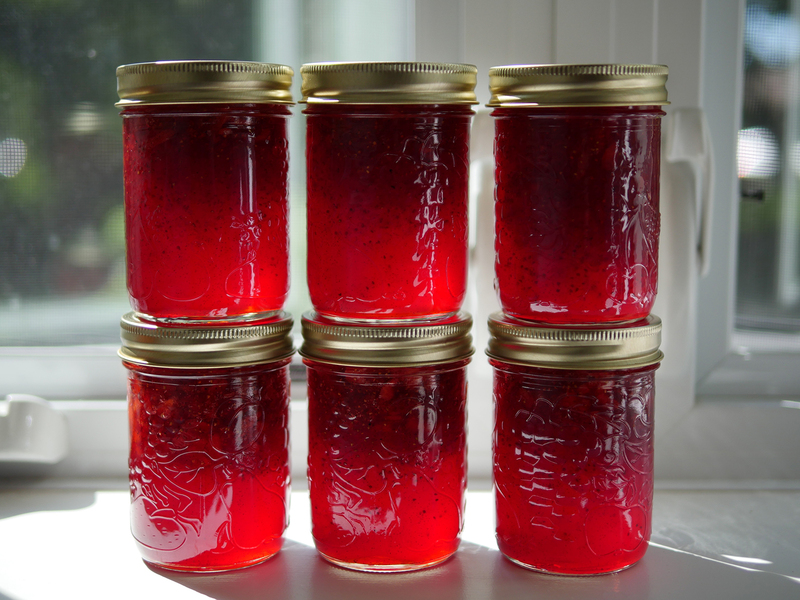 One of my favourite jam recipes is Canadian Living’s Strawberry Vanilla Jam. It’s been a couple years since I made a batch, due to our renovations and such, so I was really craving getting some going this year before strawberry season is done for the year. But of course I now have an infant, so canning anything seemed like a bit of a stretch. However, I managed to get a few quarts of Ontario strawberries (the ONLY strawberries I buy!) yesterday for $4 each, and so my 2 hours of free evening time were booked! Instead of using pectin with this batch however, I tried out the Redpath Quick Set Sugar from the grocery store. And boy did it set in a hurry — almost before I got it into the jars! Anyway, this is an amazing jam if you’re so inclined. My photo above is inspired by paintings by Mary Pratt. Don’t you just love that red glow?